There are 2 styles of window sticker - Factory and Dealer. The factory is a larger style with GM suggested prices and was shipped with each truck as required by law. The dealer is a narrower style with whatever prices the dealer wanted to place on the truck and each option. This dealer sticker would list all of the options that show on the truck SPID and would also list any dealer added options such as bumper guards, CB radio, 8 track player, fire extinguisher, etc. 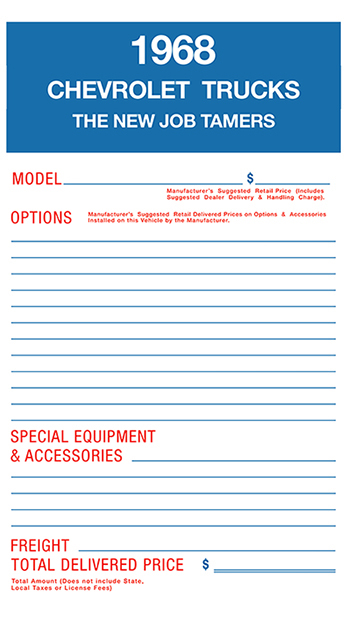 It was not uncommon for the dealer to list the option prices on these sheets higher than the GM suggested price listed on the factory window stickers. The labels shown here are ones that would be filled out by a GM (Chevrolet/GMC) Dealer. These were ordered from the Dealer Accessory Catalog by the Dealer from GM directly. 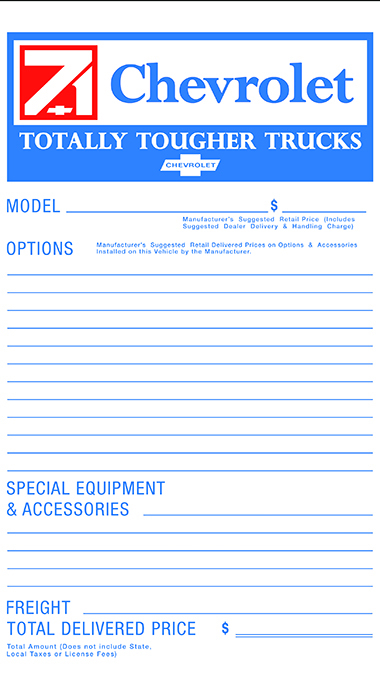 Each year from 1967 - 1972 had its own style of dealer window sheet based on Chevrolet promotional advertising used that year. This is a great item to have in addition to your SPID and looks great hung in your truck window alongside a factory window sheet at truck shows. This window sheet is printed on a durable acid-free paper. It can be laminated or kept original. Typically, double sided tape was attached to the top and bottom of all factory window stickers. If you want this tape attached to your window sticker - please let me know. 1967 and 1970 year dealer promotional sheets will be available soon.